Scientists still don’t know what’s causing flocks of birds to drop from the sky in the South, even as several hundred more fell dead onto a Louisiana highway. The puzzling phenomenon started on New Year’s Eve when thousands of blackbirds were found dead in central Arkansas. Townsfolk spent their holiday weekend removing the remains of between 4,000 and 5,000 dead red-winged blackbirds. Scientists have descended on the town, trying to find a cause for the mass die-off. US scientists believe fireworks may have caused thousands of birds to fall from the sky over an Arkansas town on New Year's Eve. Karen Rowe, of the Arkansas Game and Fish Commission, said the red-winged blackbirds probably flew low to avoid explosions and collided with objects. However, she stopped short of declaring the mystery solved, saying further tests on the dead birds are planned. Officials say more than 3,000 birds fell over the city of Beebe. The few that survived their fall stumbled around like drunken revellers, witnesses said. Birds were "littering the streets, the yards, the driveways, everywhere," said Robby King, a county wildlife officer. "It was hard to drive down the street in some places without running over them." Initial laboratory reports said the birds had died from trauma, the AGFC said. Residents reported hearing loud fireworks just before the birds started raining from the sky. "They started going crazy, flying into one another," said AGFC spokesman Keith Stephens. The birds also hit homes, cars, trees and other objects, and some could have flown hard into the ground. "The blackbirds were flying at rooftop level instead of treetop level" to avoid explosions above, said Ms Rowe, an ornithologist. "Blackbirds have poor eyesight, and they started colliding with things." Beebe police chief Capt Eddie Cullum said they were inundated with calls from residents who saw the birds fall. Poisoning has been ruled out after several cats and dogs that ate the dead birds suffered no ill effects, he added. However, another theory is that a violent thunderstorm could have disoriented a roost of blackbirds. 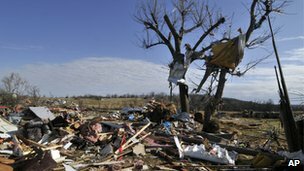 Tornadoes swept through Arkansas and neighbouring states on 31 December, killing seven people. City authorities have hired a specialist waste disposal firm to collect the dead birds from gardens and rooftops, and remove them. KENT ISLAND, Md. -- The Maryland Department of the Environment said that tens of thousands of small fish have died in the Chesapeake Bay due to the stress of the cold water. MDE spokeswoman Dawn Stolzfus said reports of a fish kill started coming in last week from Calvert County and Kent Island. Many 11 News viewers wrote in Monday to report that the fish had begun washing onto the shore. Stolzfus said the types of fish that have died are menhayden, spots and croakers. She said the fish usually swim to warmer waters before the severe cold weather that the area experienced in December. There is no word on why the fish didn't do that. The MDE said it will let Mother Nature run its course to get rid of the fish and won't intervene. Anyone who sees a fish kill should report it to the MDE at 866-MDE-GOTO. Stolzfus said the department does check them out to make sure the kill isn't caused by a pollutant. La. has mass bird kill just days after Ark. NEW ORLEANS – It isn't easy being a blackbird in the South. Mass bird deaths aren't uncommon. 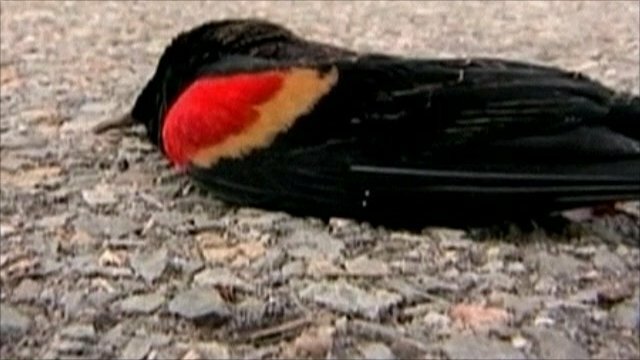 The U.S. Geological Service's website listed about 90 mass deaths of birds and other wildlife from June through Dec. 12. There were five deaths of at least 1,000 birds, with the largest near Houston, Minn., where parasite infestations killed about 4,000 water birds between Sept. 6 and Nov. 26. In Louisiana, the birds died sometime late Sunday or early Monday in the rural Pointe Coupee Parish community of Labarre, about 30 miles northwest of Baton Rouge. The birds — a mixed flock of red-winged blackbirds, brown-headed cowbirds, grackles and starlings — may have hit a power line or vehicles in the dark, LaCour said. Two dozen of them had head, neck, beak or back injuries. About 50 dead birds were near a power line 30 or 40 feet from Louisiana Highway 1. About a quarter-mile away, a second group of 400 or more stretched from the power line and across the highway, he said. In Beebe, New Year's revelers spent the holiday weekend cleaning up dead red-winged blackbirds. Some speculated that bad weather was to blame. Others said one confused bird could have led the group in a fatal plunge. A few spooked schoolkids guessed the birds committed mass suicide. Officials acknowledged, though, they may never know exactly what caused the large number of deaths. "I hope things go faster than that," said Paul Slota, branch chief for the National Wildlife Health Center in Madison, Wis. He said necropsies of the Arkansas birds began Tuesday afternoon. I'm just waiting for the wild conspiracy theories to start, that tends to be the case whenever something unusual happens that doesn't have an immediate answer. Nothing so strange as nature and while these deaths are unusual I doubt they are unnatural. Near where I live we once had thousands of fish fall from the sky, they covered the school playing fields and adjacent fields, it was surreal. Turns out it was the result of a water spout out at sea picking the fish up and dumping them half a mile inland. I remember collecting fish and filling the freezer up with them, mostly plaice, some flounder, there were a load of conger eels too, those are nasty things. I wonder if it has anything to do with the H.A.A.R.P project at all? How could it have anything to do with HAARP? HAARP only affects the upper layers of the atmosphere, hence the name High Altitude Atmospheric Research Project. HAARP is a coldwar leftover, they wanted to affect the weather over Russia which is why the HAARP array points straight at Russia.